Review : Dove Hair Fall Rescue Intensive Roots Treatment! I am so excited to review the Dove HFR Intensive Roots Treatment. I heard about this product pretty much a lot and thought. “Dove is a brand I absolutely love and I am all for hair care products. So well, why not?”..
What attracted me the most to it, is that it recognizes and tends to both kinds of hair falls: 1) Hair fall from the roots (when hair strands fall off directly from the roots) and 2) Hair breakage (when little hair strands break off from the middle). I suffer from both of it. It’s lesser than before (due to the vitamins I take/ hair care DIYs that I do) but it’s still there. 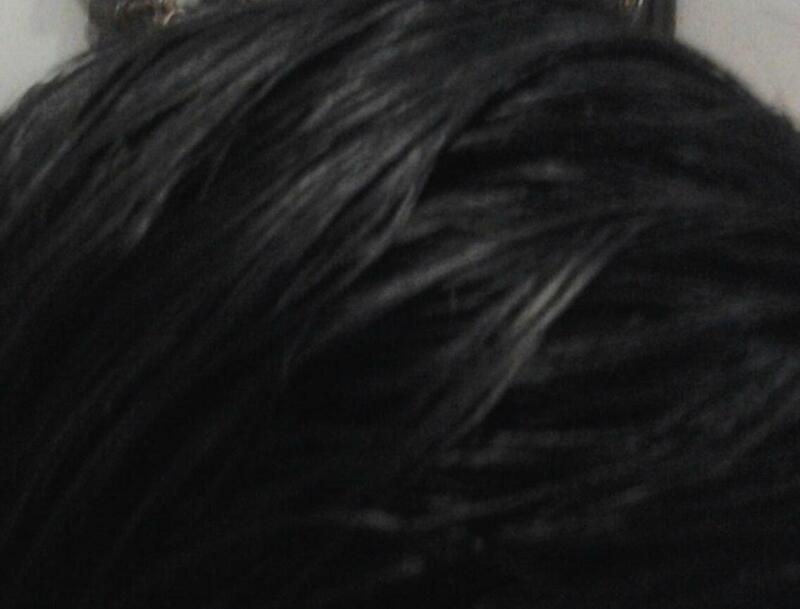 The damage that I did to my hair by rebonding it twice, is gonna be there for a while!. It has seven root power shots in the box. Each of it is 7ml. I like that by separating it into 7 vials, we know exactly how much to use for each application. 2) Break open the nozzle cap of one powershot, with caution. 3) Make series of partings in your hair and apply the lotion evenly on clean scalp. Spread it well to the hair strands. 4) Use entire content of one vial at each application and leave it until next wash. Style as usual. You might be wondering… 7 ml for one application. Isn’t that too less?. I had asked that question myself. But I was really surprised that 7 ml is more than enough. The long nozzle makes application easy. I applied them drop by drop in each hair parting. I then massaged it in and made sure my entire scalp as well as approx. 2 cms of each hair strands from the root, is saturated with it . 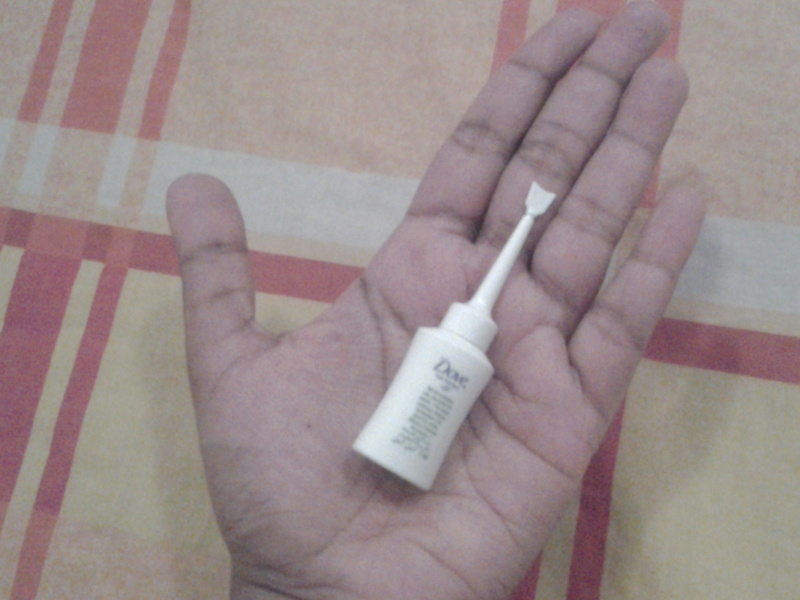 After applying it to each hair parting, I still had some amount left in the vial. So I simply squeezed it out onto my palm, and massaged it into my scalp, ensuring I got complete coverage plus there is no wastage of the product. The serum/lotion is a transparent liquid which is just slightly viscous. It’s not runny, like how a serum might be nor as thick as a lotion!. It’s just perfect enough to easily spread through your hair and get absorbed into your scalp. The serum/lotion is slightly cool, which I just loved!. Below is a shot of my hair immediately after application. It looks like you applied a gel. But within minutes, it gets absorbed and you are left with manageable and soft hair, which has a natural shine and which doesn’t look like you applied something to it. This targeted root action is meant to be a superior hairfall protection and for stronger hair. This product contains Trichazole with Ginseng & Soy Protein. Trichazole strengthens our hair from the root, keeping it glued to it’s place. Soy protein is a goldmine of nutrients which are essential for healthy hair, like B vitamins, potassium, iron, calcium, protein etc. Ginseng is a herb long used in Chinese medicine. It helping the body adapt to stress, which is known to be a cause of hair loss. These three powerhouses unite together in Dove HFR Intensive Roots Treatment to lock your hair in place and stimulate your scalp to build the optimum environment for hair growth. The RESULT: I have indeed noticed a mighty reduction in my hair fall rate. In order to judge this product in the best way possible, in the 2 weeks that I did this treatment, I did not do any other oil treatments, hair care treatments or take my vitamins. So now I know that the reduction in hair fall is solely due to the usage of this product. I highly recommend this to you. I am thinking of using a box every 4 months or so. 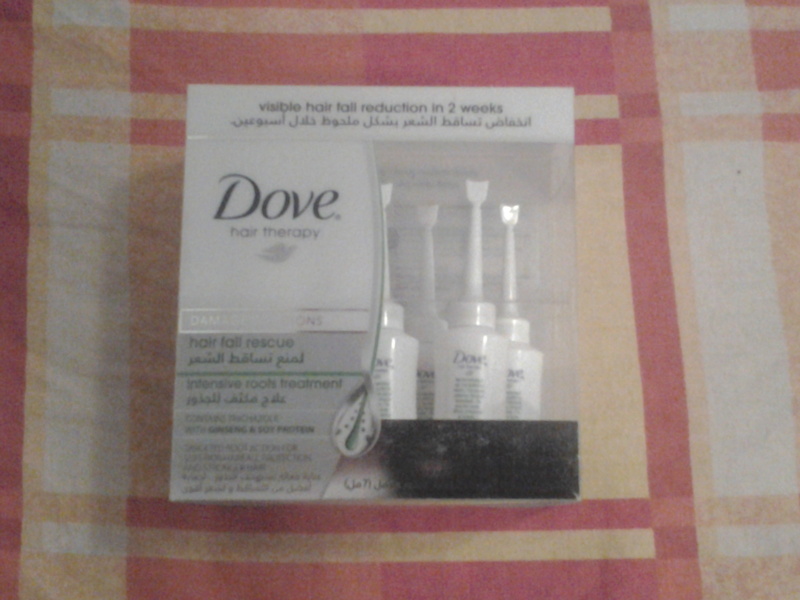 I bought this from Lulu center, Mazyad Mall, Abu Dhabi. 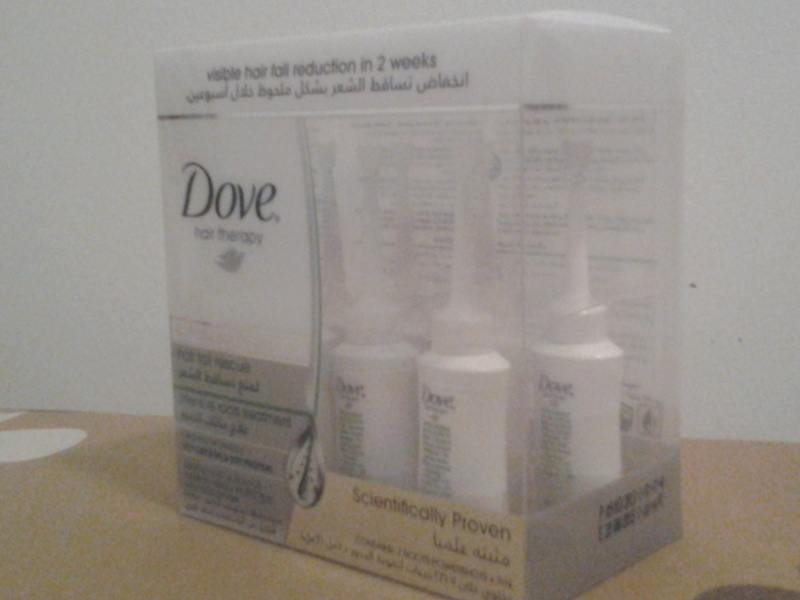 A box costs AED 33.45, which means each power shot vial is worth AED 4.77 which is really affordable. This is one drugstore product that I absolutely trust and love. Dove did a great job with this. I just noticed by the way, that this is one of the products featured in Simone Heng’s curated Glambox. They have a competition going on right now where 20 lucky ones will get a chance to win a Simone Heng Glambox each. Click http://www.glambox.me/campaign/celebrity-box to read about it.